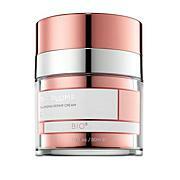 Multitasking product designed to help restore, protect, prime and prep the skin. Apply on cleansed face 15 min prior to going into the sun. Use prior to using any other topicals or applying make-up. Reapply after swimming or sweating, or immediately after towel drying. Reapply at least every 2 hours for SPF benefits. Ingredients: Active Ingredients: Titanium Dioxide 10.2%, Zinc Oxide 3.7%. Inactive Ingredients: Cyclopentasiloxane, Cyclomethicone, Dimethicone Crosspolymer, Methyl Methacrylate/Glycol Dimethacrylate Crosspolymer, Dimethicone/Vinyl Dimethicone Crosspolymer, Melanin, Tribehenin, Calcium Behenate, Sorbitan Isostearate, Dimethiconol, Alumina, PEG-10 Dimethicone, Methicone, Iron Oxides. I was looking for a primer with an SPF, this is amazing . Smoothed out my pores and made my skin glow even under foundation. After all day wear still got a compliment on skin. This product delivers light coverage, sun protection and primer all in one product. Love it. Feels like silk on my skin and I love the flawless look. I don't have to wear a foundation but if I do it's an awesome primer as well. This is very nice sunscreen with a good tint. I got the fair and it works great on my pasty 70 year old skin. I have in on autoship, but may not continue. It would be five stars except that it is quite expensive for the amount in the bottle. If they double the size on a special, I will buy again. If you can afford it, get it. Its very nice.